This is what I’ve been doing this week. And actually its gone together much faster than I thought it would, I’ve only worked on it four or five times. And since Jay’s been at school from 7am-10pm every single day for the last ten days (except Sunday) its been nice to have something to do while Ben’s asleep. 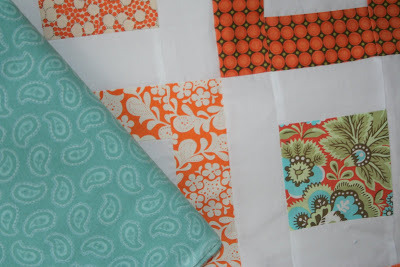 I’ve been saving these orange fabrics for a lap quilt, and I just LOVE a one color quilt with white. I bought the blue flannel backing yesterday so hopefully I’ll start the quilting tonight, which is bound to take a LONG time. This will be a lap quilt for my living room, with really soft warm flannel on the back just in time for COLD weather! What a neat pattern! You’ve been a busy girl. 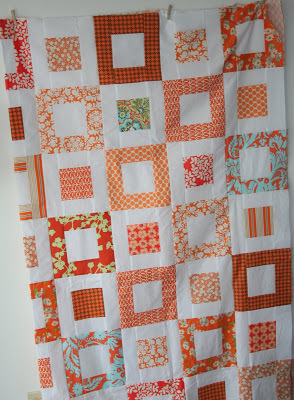 Your Orange & White quilt is so stunning – WOW! Your blog is great and I added it to mine and let others know to check you out. Do you live in Washington? We will be near Poulsbo during Thanksgiving!